I am a doctoral candidate in the Department of Politics and International Relations, University of Oxford. As a researcher affiliated with Oxford’s Centre for Technology and Global Affairs and the Project on Democracy and the Internet at Stanford University, my work examines large technology “platforms,” seeking to understand new patterns of corporate power, private governance, and transnational regulation in global politics. My writing tries to bring perspectives from political science (international political economy, global governance) together with a background in digital media research and ‘internet studies’ heavily influenced by my time as a graduate student at the OII. Currently, I’m focusing on ‘platform governance’ and content moderation; past work has looked at the political economy of bots, social media manipulation, and a host of other tech policy challenges. I’ve published writing on technology and politics in Foreign Affairs, Wired Magazine UK, the Washington Post, and other popular outlets. I have recently begun contributing to the Los Angeles Review of Books. I enjoy giving talks sometimes, and like to use conferences as an excuse to travel. Exploring the global political impact of content decisions. 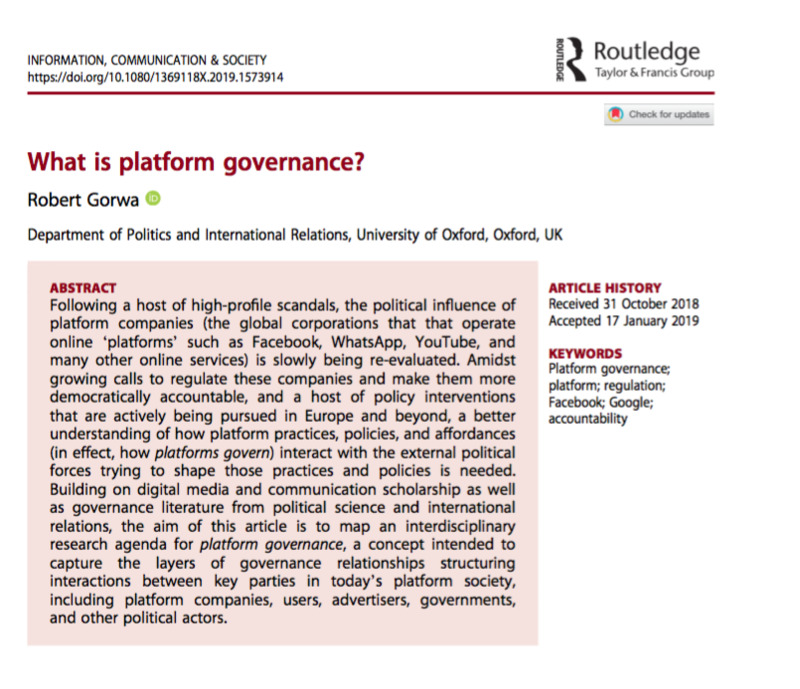 How do platforms govern, and how should they be governed? How do private actors shape the global cybersecurity conversation? What is the political economy of online automation? This article seeks to provide a first mapping of the interdisciplinary research agenda for platform governance, overview emerging governance modes, and discuss some of the normative principles which promise to shape platform governance going forward. Information, Communication & Society, 2019. 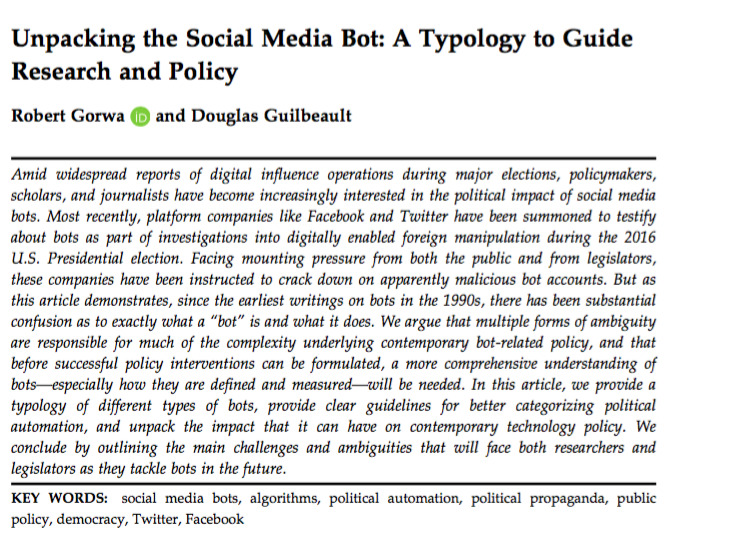 In this article, we provide a history and typology of different types of bots, provide clear guidelines to better categorize political automation and unpack the impact that it can have on contemporary technology policy, and outline the main challenges and ambiguities that will face both researchers and legislators concerned with bots in the future. Timothy Garton Ash, Robert Gorwa, Danaë Metaxa (2019). Glasnost? Nine ways Facebook can make itself a better forum for free speech and democracy. Oxford, UK: Reuters Institute for the Study of Journalism. Carl Öhman, Robert Gorwa, Luciano Floridi (2019). Prayer-Bots and Religious Worship on Twitter: A Call for a Wider Research Agenda. Minds & Machines. Robert Gorwa, Anton Peez (2018). Tech Companies as Cybersecurity Norm Entrepreneurs: A Critical Analysis of Microsoft’s Cybersecurity Tech Accord. Hague Conference on Responsible Behaviour in Cyberspace, (The Hague, November 5-7). Robert Gorwa (2018). Unpacking the Ecosystem of Social Media Manipulation: A Polish Case Study. Computational Propaganda: Political Parties, Politicians, and Political Manipulation on Social Media, edited by Samuel Woolley and Philip Howard. Oxford University Press. Robert Gorwa, Philip Howard (2018). Studying Politically Vulnerable Communities Online: Ethical Dilemmas, Questions, and Solutions. ICWSM Workshop on Exploring Ethical Trade-offs in Social Media Research (Stanford, June 25). Robert Gorwa, Douglas Guilbeault (2018). What Should We Do About Political Automation? Challenges for Policy and Research. International Communication Association (Prague, May 24-28). Douglas Guilbeault, Robert Gorwa (2018). Current Challenges for Bot Policy and Foreign Interference. Washington, DC: Campaign Legal Centre. Robert Gorwa (2017). Computational Propaganda in Poland: False Amplifiers and the Digital Public Sphere. Oxford, UK: Oxford Internet Institute. “The Last of the Unicorns: Facebook and the Fight for a Better Future.” Los Angeles Review of Books, March 2019. “Facebook’s Decency Conundrum.” Wired Magazine (UK), November/December 2018. “Platform Moderation and Its Discontents.” Los Angeles Review of Books, August 2018. “Tinder Nightmares: The Promise and Peril of Political Bots.” Wired (UK), July 2017 (with Doug Guilbeault). “Quantum Leap: China’s Satellite and the New Arms Race.” Foreign Affairs, September 2016 (with Taylor Owen). Outlining self-governance policy suggestions for Facebook, and summarizing some insights from our RISJ report on content moderation and speech. Wired (UK), March 2019 (with Danaë Metaxa). Reblogged at OxPol. 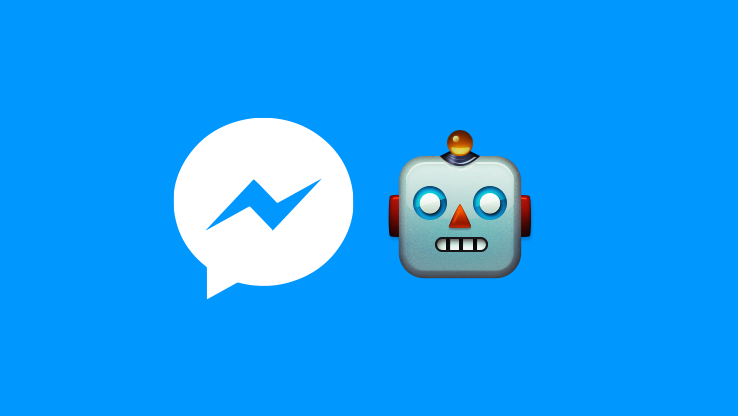 Thinking about solutions for Twitter’s (largely self-imposed) bot problem. Quartz, October 2017. On Facebook, foreign interference, and sharing data with researchers. Washington Post, May 2017 (with Phil Howard). Why detecting ‘Russian bots’ isn’t as easy as people seem to think. NetPolitics, March 2017. Reflecting on global privacy and security coordination problems after the Dyn DDOS attack. OpenCanada, November 2016. A conversation about quantum computing, R&D, and state power. World Politics Review, October 2016 (with Taylor Owen). Talking to a colleague about the ethics of doing research in conflict zones. The Envoy, October 2015.